Super Bowl City, along San Francisco's Embarcadero, sits in the heart of an area typically populated by many of the city's homeless community. Less than two weeks ago, local activist Stuart Schuffman left his home in the Mission District in San Francisco and walked by Division Street — a thoroughfare underneath the 101 freeway that separates the well-to-do SoMa neighborhood from the working class Mission. "It was crazy, there were just tents for blocks in each direction. You couldn’t even go on the sidewalk," Schuffman said. Division Street usually hosts a small homeless encampment year-round, but never had he seen anything like this. Back in 2013, when Super Bowl 50 was awarded to the Bay Area, Santa Clara’s brand new Levi’s Stadium was scheduled to host the game, but San Francisco, 45 miles north, would be the epicenter of the pre-Super Bowl build-up. 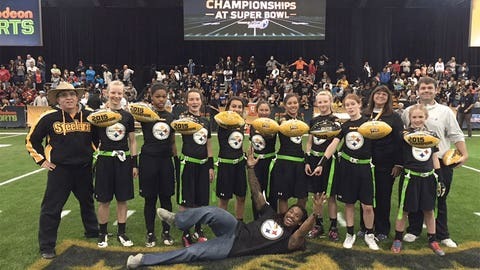 The Super Bowl Host Committee raised $50 million, through various corporations, for weeklong events at the NFL Experience at the Moscone Center and Super Bowl City along the Embarcadero. Both the gleaming City by the Bay and the NFL would be on full display for the world. But there was a problem. While San Francisco ranks as the second wealthiest city in the country per capita (behind San Jose), its homeless population has grown by 7 percent over the past 10 years. More than half of the homeless stake up residence in the area surrounding Super Bowl City. Last August, while referring to the NFL coming to town, Mayor Ed Lee told reporters the homeless will "have to leave." Last summer, Mayor Ed Lee said the homeless population would "have to leave" the areas of the city where Super Bowl events would be prominent. But where would they go? Since Google, Twitter, Uber and other tech companies moved within the city’s limits in the past few years, rent has skyrocketed. The average two-bedroom apartment cost hit $5,000 a month in October, the highest figure in America. As a result, evictions surged over the past five years and the middle class "has moved out altogether," University of California-Berkeley professor Malo Hutson told the San Francisco Chronicle. With an an ever-expanding elite class, the impoverished few are feeling further exposed. As we saw in Brazil two years ago during the World Cup, when the world is watching, money talks and the unsightly can be easily swept away. I met Schuffman at the Rainbow Grocery co-op on the corner of 14th and Folsom on Tuesday. Inside, world music is playing and vegan turkey burgers and cold-pressed juice are bought by the mostly white clientele. Just up the street a Foods Co. grocery store serves the chronically poverty-stricken segment of the neighborhood. "It’s a hyper microcosm of what’s happening in the county," Schuffman says. Schuffman sports a thick red beard and speaks in quick, excited bursts. After college in Santa Cruz, he moved to San Francisco and joined a long line of white liberal activists in the city. He started a popular website focusing on socio-economics with a comic twist, BrokeAssStuart.com. He even ran for mayor against Lee in 2015 under the motto, "Go for broke." He got 9.6 percent of the vote. "People say, ‘Why are you mad?’" he says. "How can you not be? I know many of us are this close to being on the street ourselves." Shortly after Schuffman spotted the large encampment, reporters began arriving at Division Street, 2.5 miles from Super Bowl City. There were no services and the street had started to reek of human feces and urine. When some of the homeless were questioned by fusion.net, they said they had been actively corralled into the area by police. "No one in city hall would say anything, no one would take any responsibility," Schuffman said. Soon Schuffman wrote an article on his website pointing to a systematic forced mass migration in the days before an estimated one million visitors will descend on the Embarcadero and the Financial District. Mayor Lee, for his part, maintains that the city is interested in serving a greater purpose. "No, I don’t think we’re hiding anybody," he told ABC 7 News this week. "This is a city of a lot of tolerance, but we do want to get people off the streets. I mean that is our ultimate and day-to-day goal." The city’s history of displacement is extensive. Most famously in the 1960s, M. Justin Herman of the San Francisco Redevelopment Agency razed 60 city blocks of mostly black-occupied residences, scattering the occupants to Oakland and beyond. Since then the poor, and now middle class, have been chess pieces in an ongoing struggle for the power at the top of San Francisco’s political chain. Recently, the stakes have increased as billions have surged through the city. 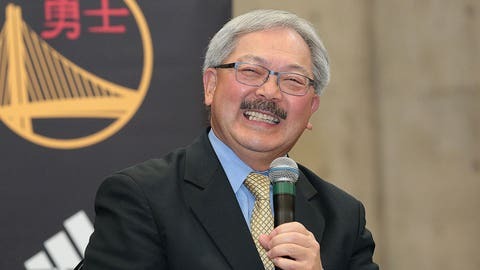 On Jan. 22, just days before Schuffman first noticed the homeless tents, three of Mayor Lee’s top fundraisers were indicted on corruption charges. As City Hall’s political machine went into damage control, local media outlets were publishing interviews from the encampment on Division that were embarrassing the administration. Uber driver protests a threat to SB Sunday? Six days later, on Jan. 28, a grainy video surfaced on local resident Jordan Buck’s Facebook page, showing vans and trucks with the Orwellian name "Clean Patrol" on the side of their vehicles appearing to remove tents and decamp the homeless from Division Street. Where did they go? I ask Schuffman. Activists were furious. But this is San Francisco, birthplace of hippies and counter-culture movements — activists are easily ruffled. But the rage on the streets, then and now, seems to be real. This week the Justice Department announced it would investigate the San Francisco Police Department for a shooting of a young black man, and a separate incident of homophopic and racist texts sent between officers. Then on Monday, Uber drivers took to the streets in protest at perceived unfair rate cuts by the $60 billion San Francisco-based company. "It’s a city of anger," Schuffman says. 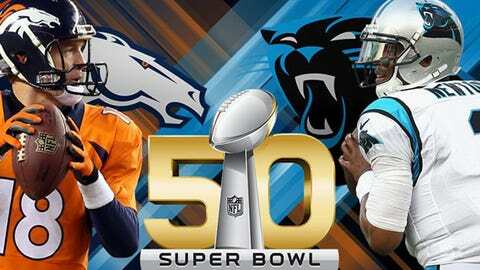 "The Super Bowl is our rallying cry." On Wednesday, along with the Coalition on Homelessness, Schuffman organized a mass protest that directly faced Super Bowl City — a replica of tent city located ironically on Justin Herman Plaza, named after the man who displaced around 10,000 poor residents more than 50 years earlier. Schuffman expected attendance at the rally to be in the thousands, however The Associated Press reported it as dozens. 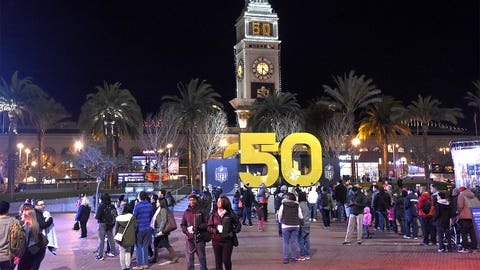 In Santa Clara, excess costs for Super Bowl 50 are paid for by the organizing committee, but in San Francisco $5 million of public money used for city services during this week are not covered by the committee. Schuffman is demanding the city match that amount to put a dent in the homeless crisis. "With that (money) you can permanently house 500 to 600 people," he says. But no one in City Hall seems sure how that much money was earmarked for the festivities in the first place. The board of supervisors, according to Alternet, only recently found out that public funds would be used, and was "infuriated." Who is to blame? When corporations begin to have an outsized stake in a city, including the NFL and its weeklong show, where do the voiceless turn? And in San Francisco … where are the voiceless? On Division Street a few of the tents have returned. Across from the Rainbow Grocery, two men and a woman, roughly in their 40s, are talking outside of a tent. "Some people got pushed over past Byron Street," one of the men, who didn’t want to be named, says when I ask what happened to the tents. "Other than that …" his voice trails off. What about the Super Bowl coming to the Bay? The woman — Ra-Ra, she’s called — is giddy. "I wish it was the 49ers," she says and laughs. "My daughter used to play when she was younger. I love it." Except Ra-Ra was evicted from her place in the Fillmore neighborhood eight months earlier. With no place to turn, she ended up begging for money and in a tent. People like Ra-Ra won’t be allowed near Super Bowl City. According to Alternet, the homeless have been prohibited. For the rest of the week the battle for the heart San Francisco will rage on the fringes. While the NFL and City Hall will take turns marveling at their spectacle. Flinder Boyd is a former European professional basketball player turned writer. On Twitter he can be found @FlinderBoyd. He’s in the Bay Area all week for a series of articles on the events around Super Bowl 50.